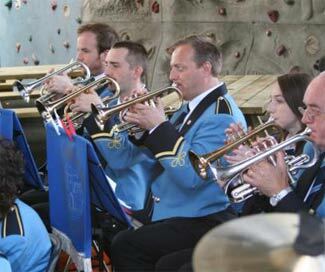 On Friday 6th July 2007 the band was privileged to play for His Royal Highness The Prince Edward, Earl of Wessex, who was guest of honour at a "thank-you" garden party held at the Scout Centre in Crawfordsburn. Over 800 leaders and guests from all over Northern Ireland enjoyed the best weather of the week as the rain stopped and the afternoon sun emerged over North Down. His Royal Highness, the Earl of Wessex, was welcomed to the event by the Lord Lieutenant of County Down, Mr William Hall. Many leaders from SE Antrim Scout District engaged in light-hearted conversation with the royal visitor as he mingled with the invited guests in the relaxed surroundings of the main Scout camping and activity centre for the Province. This year marks the centenary of the formation of the Scout Movement and the garden party was arranged to thank leaders for their continuing devoted service to the organisation. The Earl acknowledged the considerable efforts and contributions made by all leaders in their work with the Scouting youth of Northern Ireland. Other dignitaries who attended the garden party included the First Minister, Rev. Ian Paisley, accompanied by his wife, Baroness Paisley and North Down MP, Lady Sylvia Hermon. The official proceedings were completed when His Royal Highness planted an oak tree to commemorate his visit and to mark the Scouting Centenary.